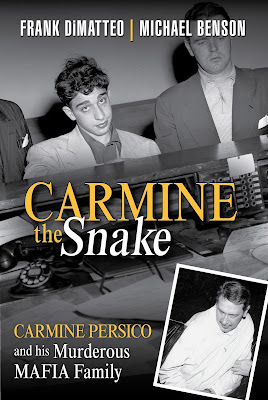 The Washington Times published my review of Carmine the Snake: Carmine Persico and His Murderous Mafia Family. "Carmine the Snake” Persico has been identified by the FBI and the Justice Department as the longtime head of the New York Cosa Nostra Colombo crime family. Although incarcerated in 1987 due to his conviction in the 1986 famous Mafia Commission federal RICO case, he reputedly still runs the Colombo crime family from prison. He made his name in the Profaci crime family as part of the hit team that shot and killed mob boss Albert Anastasia in a New York barbershop in 1957. Frank DiMatteo, who describes himself as a mafia survivor and previously wrote “The President Street Boys: Growing Up Mafia,” offers a “street level” view of the Colombo boss in “Carmine Carmine the Snake: Carmine Persico and His Murderous Mafia Family.” Michael Benson, a true crime author who wrote “Betrayal in Blood,” is the co-author of this book. … “Using a combination of brashness, cunning, and an appetite for extreme violence, Carmine Persico Carmine Persico rocketed from gangbanger on a Park Slope, Brooklyn street corner to boss of the Colombo crime family, where he reputedly became the longest-reigning godfather in modern Mafia history — mostly from behind the bars of a federal penitentiary,” the authors tell us. The book covers in detail the internecine mob war between the Gallos and the Profaci crime family, with each faction murdering and attempting to murder each other. The Gallo crew put a bomb in Persico's car, but the detonation failed to kill him. The war ended with Profaci’s death and the murder of Crazy Joe Gallo in a restaurant.